Stone Baking Board & FREE MEZZALUNA Pizza Cutter/Slicer. And it's revoluntionising the Outdoor cooking scene... Woodfired pizzas are only the beginning for this ultimate in Portable Pizza Ovens.... Cook meat, vegetables, bread and just about anything in this multi function outdoor oven. Choose between Woodfired, Gas or Charcoal to best suit your needs. No professional chef skills required, just make the pizza, pop in the oven and 90 seconds later you're eating it. UUNI is taking the family picnic to a whole new level! See total inclusions below, also instructional videos. Uuni Pro is the first outdoor oven to include a multi-fuel function, capable of running on wood, charcoal or wood pellets. Uuni Pro is the ultimate tool for your outdoor kitchen. It's Super Hot Uuni Pro can reach temperatures of 500. 932 F in just 20 minutes, and it takes only 60 seconds to cook an authentic pizza (up to 16-inches in size). Unparalleled Versatility The cooking area of Uuni Pro and it's multi-fuel capabilities means Pro is extremely versatile -you can cook a huge variety of food; large roast meats, fish, vegetables, bake bread and lots more. 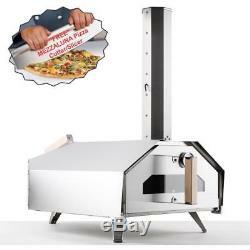 Ultimate Flexibility Uuni Pro comes with the Wood + Charcoal Burner. As the name suggests, it's for burning regular wood kindling as well as charcoal. We love using the Pro with charcoal to provide the main baseline of heat and then before a pizza goes in we throw on a few bits of wood to give the extra oomph and flavour. Wood Pellet Burner available as an option in Australia. Uuni Pro comes with 2 doors. Uuni Pro Door with Thermometer. Helps you to check out the oven's temperature at a glance. Uuni Pro also includes our patent pending. This door has a'letter box' opening to slide pizzas in and out easily. It's fully removable too so it's easy to put in a large piece of meat or bread. This is the only door to use with the Gas Burner. Multi-fuel capabilities, allowing users the option to burn wood, charcoal and wood pellets. Large cooking surface, enabling you to bake 16 pizzas, breads, roast joints of meat and lots more. Uuni Pro is transportable at approx. 57 lbs or 26 kg i. Can be moved from table top to garage after use or loaded in the trunk of a car. Dimensions: 29.13"/740mm (L), 19.29"/490mm (W), 31.1/790mm (H). Cooking surface: 17.7" by 17.7" (450mm by 450mm). Made of 430 stainless steel. Security loop - the ability to secure your Pro to your garden furniture. 15mm corderite stone for high heat retention. What's in the box. Stone Baking Board (4 parts). Note: Gas not yet certified for use in Australia at this time. This would include large items that are not easily transportable. Same day minimum, 2-3 Day Standard. Our policy lasts 30 days. To be eligible for a return, your item must be unused and in the same condition that you received it. It must also be in the original packaging. All the things a smart tradesperson looks for. The item "UUNI Pro Portable Pro Woodfired Pizza Oven incl. Stone Baking Board & FRE" is in sale since Wednesday, March 14, 2018. This item is in the category "Home & Garden\Yard, Garden & Outdoor Living\Outdoor Cooking & Eating\BBQs". The seller is "stonextoolsonline" and is located in Bowral.